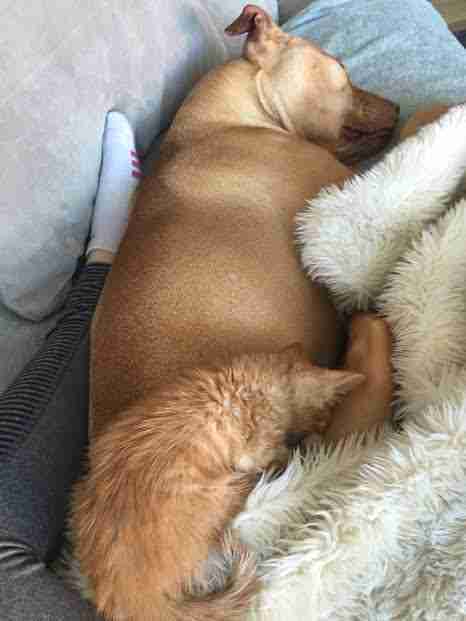 Never has a dog been more ready to become a big brother to a cat. ... and he knows it. Rebecca Pizzello rescued Bubba from a shelter in Phoenix, Arizona, six years ago, when he was just 3 months old. At the same time, Pizzello's roommate had rescued a litter of kittens and was caring for them until they were old enough to be adopted. "Since then, Bubba has had an endless affection for cats," Pizzello told The Dodo. "Like, literally obsessed. I always knew he'd love having one of his own, but I wanted to wait until we moved to New York City [from Los Angeles] this year." After weeks of applying for a rescue cat, Pizzello finally received a call from Brooklyn Animal Action and learned that a baby kitten in need would be ready in a week for a forever home. The rest was history. "Rue stood out like no other and I took her home as fast as I could," Pizzello said. "The fact that Bubba and Rue have identical coloring still blows my mind ... I knew Bubba would be filled with joy the second we walked in the door and boy was I right." Bubba immediately knew he would need to be gentle with his new little sister, and just after just a few hours of settling in to her new surroundings, Rue fell asleep right on top of her big brother. Pizzello said their connection was instant and now the two of them are inseparable. "Rue thinks Bubba is her mom and Bubba loves it," she said. "He bathes her like a baby and snuggles close to her to make her comfortable." Pizzello also described Bubba as a pretty mellow dog who's grown up with not only kittens, but puppies, and small and larger dogs over the years. On the other hand, Rue, who is only 2 months old, loves to cuddle nonstop. "She's so tiny still so it's like having a baby right now," Pizzello said. "If I walk away somewhere, [Bubba] always follows me. Now I will say, 'Go watch your sister,' and he turns around and goes and watches where she is," she said. When Rue isn't resting on Pizzello's chest (listening to her mom's heartbeat comforts her), she can be found right by Bubba's side. "They will definitely be a fun duo to watch grow up together," Pizzello said. You can follow Bubba and Rue on Instagram. For more of Bubba, check out his personal account here. Want to give a rescue pet a loving forever home? Get started at Adopt-a-Pet.com. Check out this video of a rescue dog who's dedicated his life to being his bird's favorite place to sit.